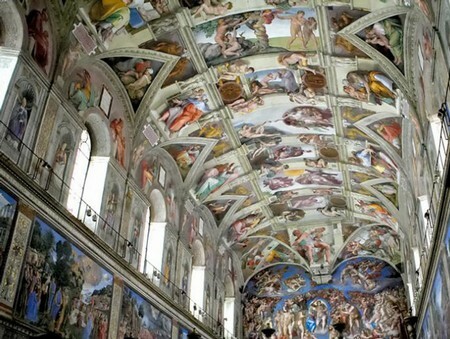 The Sistine Chapel has had numerous artists working on its creation throughout history. The chapel, one of the best-known chapels in the Apostolic Palace where the Pope resides, showcases the works of masters Michelangelo, Raphael, Bernini, and Boticelli. The most well known among these, however, is Michelangelo, who labored on the frescoes on the Sistine Chapel’s ceiling for many years despite the fact that he wasn’t a painter, but a sculpture. The Sistine Chapel was constructed in the 15th century by Giovanni de Dolci under the behest of Pope Sixtux IV from whom the chapel was named. Desigend by Baccio Pontelli, the chapel’s internal measurements were built according to the dimensions of the Temple of Solomon as written in the Bible. The walls were painted by the period’s well-known artists like Botticelli, Ghirlandaio, Pinturicchio and Signorelli. A screen of marble or transenna divides the chapel into two. This fence-like division was made by Andrea Bregno along with Mino da Fiesole and Giovanni Dalmata. Aside from the screen, Andrea Bregno also designed the pulpit on the right of chancel, the larger area where the clergy stays during religious activities. The history of the Sistine Chapel took a different direction when Pope Julius II took over its construction. This pope is known for saving the papacy and being acknowledged as one of the most important Popes in Vatican history. Because of him, the chapel displayed the most beautiful artworks of Italian artists. This program of works was designed to rejuvenate the weakening Vatican image that time. 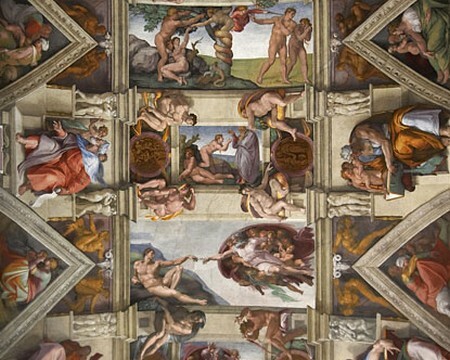 The frescoes on the ceiling of the Sistine Chapel were mainly done by Michelangelo. Although his major body of work is in sculpture, Michelangelo was skillfully coerced by Pope Julius to work on the ceiling of the chapel. The master artist was motivated to do the work because Pope Julius has promised him he’d get a very lucrative commission on a later project. That project was the 40 or so large sculptures for the tomb of the Pope. Although in the movie he was depicted working alone, in truth he had a team of assistants working for him. They mixed his colors and cleaned his brushes for him. Perhaps one or two who had shown excellent talent were allowed to paint a piece of the sky or a part of the scene, but the works of these apprentices were insignificant and indistinguishable when seen from below. Because Michelangelo was not a painter by profession, albeit having skills for sketching his sculptures before chipping away the stone, he had to learn the techniques of fresco painting fast. This slowed him down a little at first because he had to correct whatever mistake he had made while learning the craft. When he had learned the basics and found his rhythm, however, he worked like a man on fire, not sleeping or eating for long periods to finish a panel or a scene. All in all, he was able to finish the commission in four years from July of 1508 to October of 1512. It did not end there, however. Some 22 years after he had finished painting the ceiling of the Sistine Chapel, Michelangelo returned to paint the panel called the “Last Judgement.” This scene showed changes in the artist’s style and adaptation as well as the political changes happening in Rome that time. Once it was completed, the Sistine Chapel was immediately regarded as a national treasure that had to be preserved for the generations to come. Hi, thank you! More people should make more information like this. this has helped me a lot.